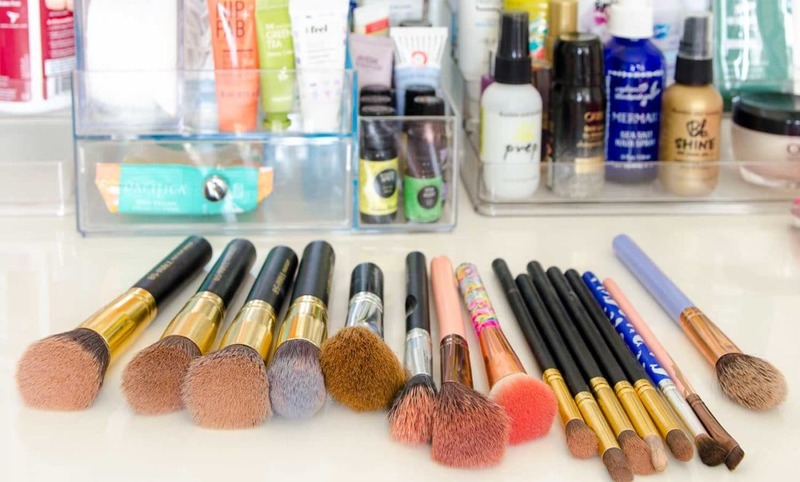 How OFTEN should I clean my makeup brushes? What should I use to clean them? 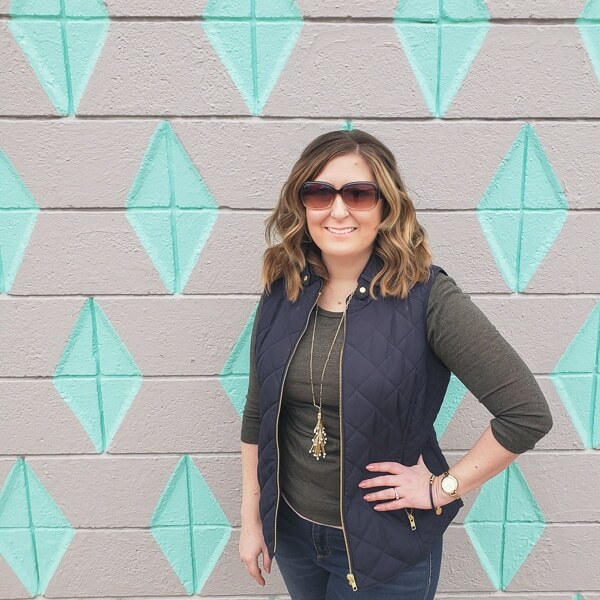 I did some research and put a new product to the test! My recently organized makeup station is still working so much better than anything I’ve tried before. 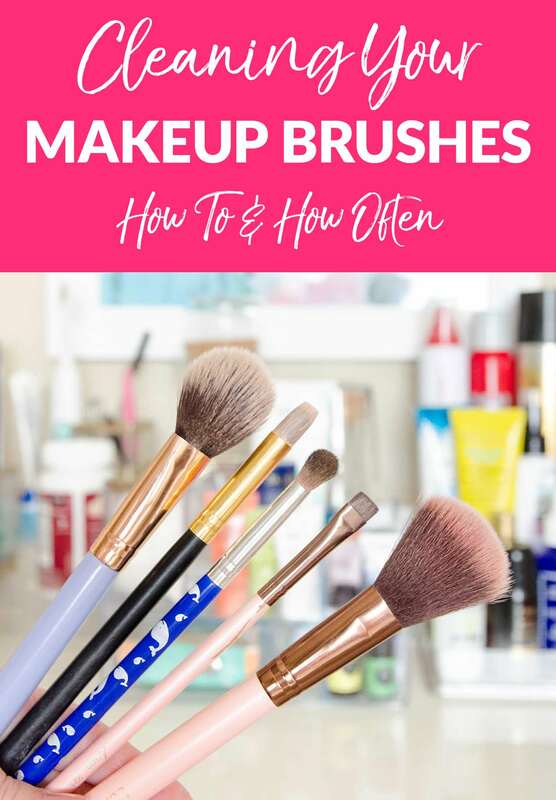 But having everything all nice and neat made me realize how long I had been slacking on properly cleaning my makeup brushes. I knew I wasn’t washing the brushes often enough…but I had to Google how often it was really supposed to happen. 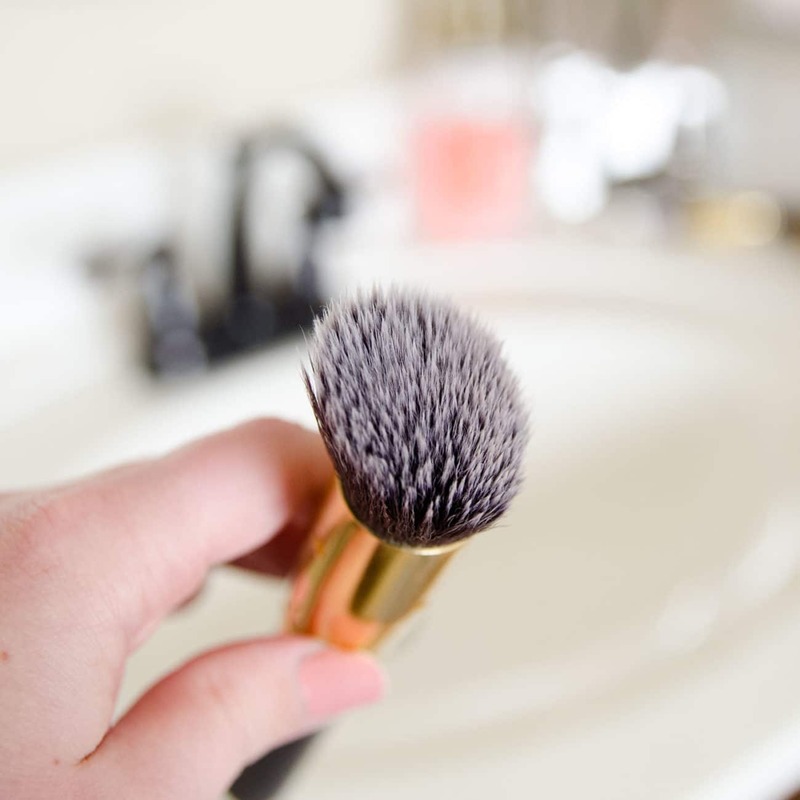 Experts recommend eye brushes should be washed twice per month and other brushes should get a good cleaning monthly. I’m going to add the concealer brush onto the twice month rotation as well because it gets so gunky. PS: All those gold & black brushes are an insane steal of a price. They come in a huge set, actually work really well, and cost less than you’d pay for one brush at the beauty stores. I think one of mine broke, but the rest are going strong after 2 years. Quick Tip: Use the calendar on your phone to set up repeating reminders so you don’t forget! From now on, you can find me doing a deep clean of all the brushes the 15th of the month, and then the concealer and eye brushes the 1st of the month. I’m so much better at actually getting things done when reminders pop up on my phone instead of relying on memory. Once a had a plan of how often to clean the brushes, I still needed a better process of how to do it. 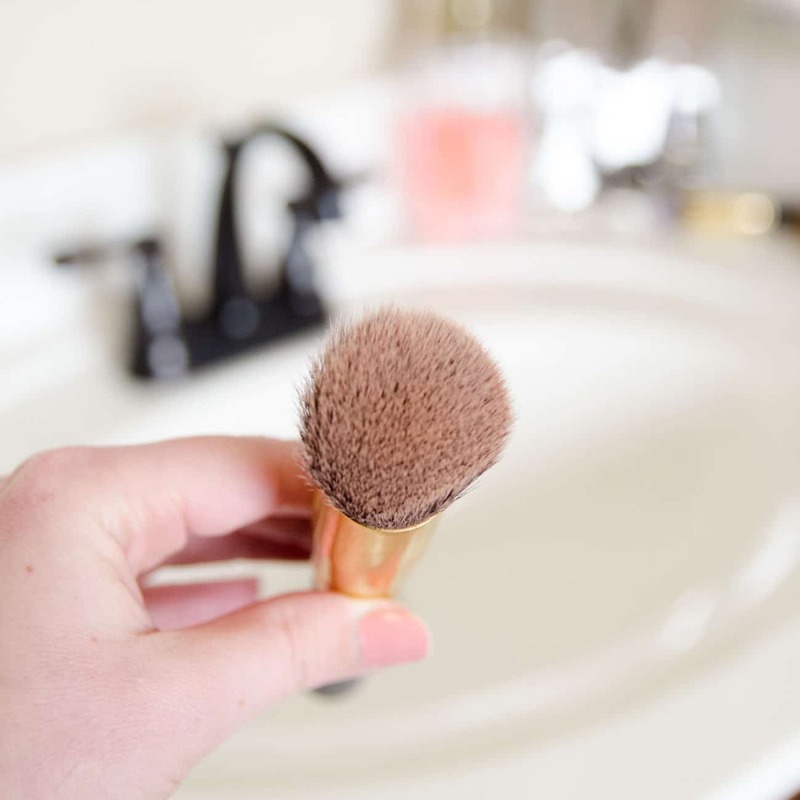 What is the Best Way to Clean a Makeup Brush? Since Amazon seems to know everything, I started there and ended up reading tons of reviews. AND I got distracted by things I never knew existed, like a sponge in a tin that you wipe your brush on while applying eyeshadow before changing colors to prevent colors from getting muddied together. 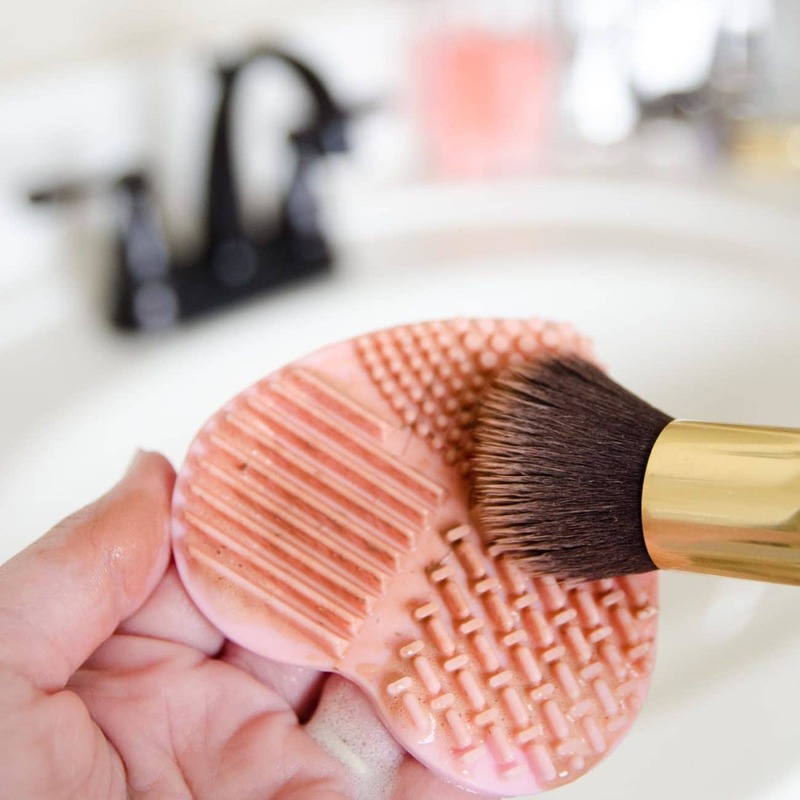 That product stole my attention a bit, so once I decided I also needed a silicone brush cleaning mat, I gravitated toward the one that was packaged with the magic tin. Plus, the packaging looked like a little gift and it wasn’t outrageously priced. I wouldn’t say it was a BAD decision because both products 100% work, but I wish I had gone with a larger silicone mat like this one so I could clean two brushes at one. I’ll probably end up ordering that one before I do all the brushes at once again. Live and learn, right? I also ordered some highly-rated brush cleaning shampoo, but it hasn’t arrived yet. Once I was fully aware of how bad the brushes needed to cleaned, I couldn’t wait and just used some gentle soap. I’ll update the post when I get the special brush stuff in. Since my brushes were inexpensive to start with, I was okay with the risk until I can use the legit stuff next time. Look how well the little silicone mat worked though! And then the next picture is after I applied some soap to the mat and started rubbing the brush bristles on the different textures. Different brushes really did work better on different areas. For example, the parallel lines were perfect to soften up the concealer brush before moving on to the other sections. I was pretty disgusted by how much makeup came out of every brush. For some of them, I had to rinse the mat and brush midway through the cleaning and then go for round two with the soap. No matter how dirty the little mat got, it rinsed clean right away. I had honestly forgotten that the tips of these brushes were white! Once I rinsed all the soap out of each brush, I laid them flat to dry on an absorbent towel. For larger brushes that can get mishappen by laying flat, you can hang them over the edge of the counter. Even for the brushes that needed two rounds of cleaning, it only took about a minute per brush. That definitely puts it in fast fix category compared to the old days when I just used my hands or a towel to rub the brushes on. Thankfully this isn’t just quicker, it was way more effective as well. 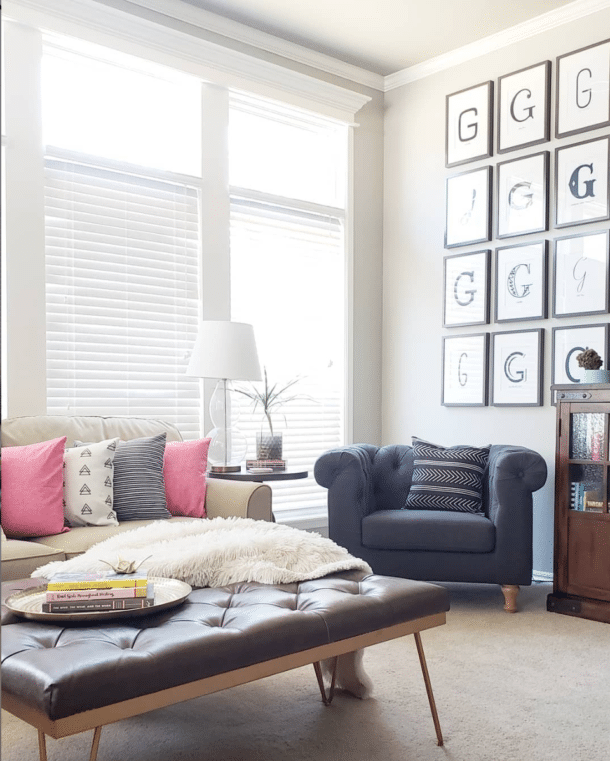 HOWEVER, if you don’t have the budget to buy anything right now, don’t let that stop you from putting the task on the calendar and still tackling it. Grab some baby shampoo at the Dollar Tree and go to town. I have a habit of not doing things if I think I can’t do them right, and that’s crazy. Imperfect progress is still a fabulous thing! If you can rationalize one thing and already have brushes, I’d go with the larger mat. 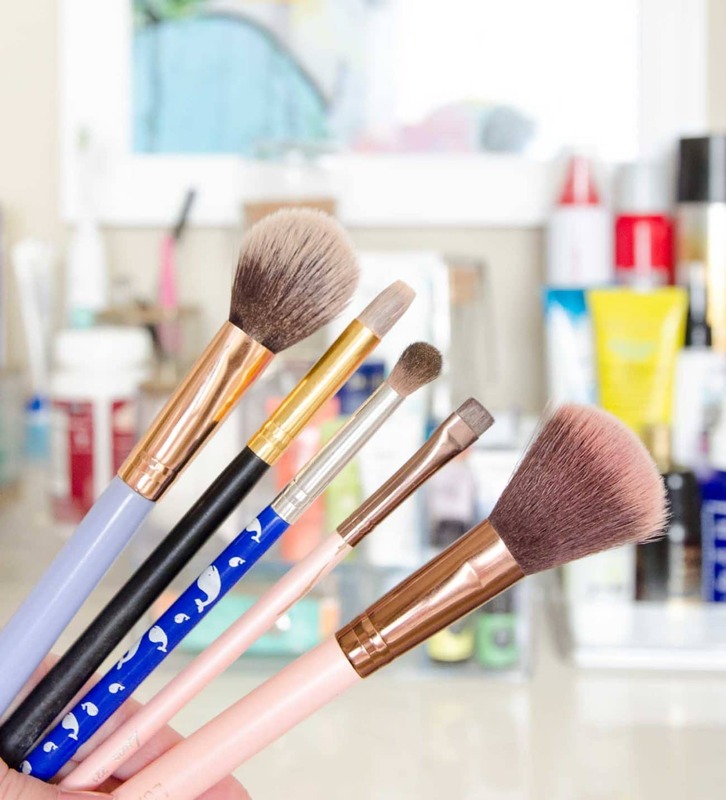 If you’re just using the brushes that come with your make up products, order the brush set first. It’s crazy what a difference it makes! Still need a bit of motivation? I think I’m going to use brush cleaning time for a little bonus Netflix viewing. Folding clothes from the dryer always goes faster if I’m rewatching a favorite show (Gilmore Girls, Parenthood, Heartland), and I’m more eager to get the task done if I think of it as going to watch something. I bet the same will apply for this! Confession time…please tell me someone else has gone longer than recommended for this task? Now that we know what to use to clean them and have reminders on the calendar, hopefully, those days are behind us! You are not alone! I’ve never cleaned most of my brushes. The mineral foundation brushes I may or may not remember to clean them one every other year! Terrible :-0 I even have brush “shampoo” and just never think to clean my brushes. I will make a better effort and maybe even try this method. Thanks for sharing! Thanks for confessing with me! 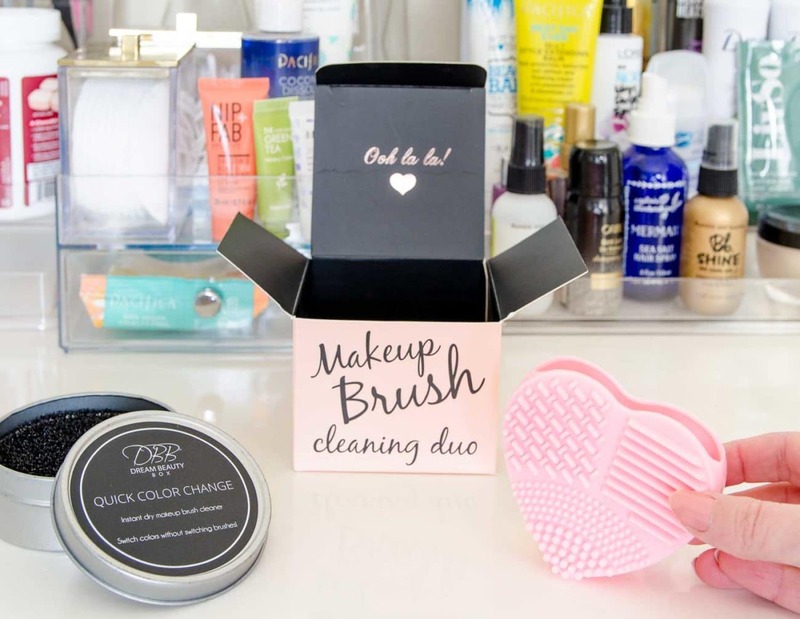 You wouldn’t believe how much gunk comes out of your brushes! I’m guilty too! I know this is something I should do and even have brush cleaning spray but it always seems so daunting a task. Something to save for a day when everything else is done and as we all know that day never comes… I will try the mat maybe that will simplify the job and make it more manageable on a regular basis. You are so right that it seems daunting! I need to edit the post to add this, but I think I’m going to watch Netflix next time while I do it too. Sneaking in 15 minutes of TV time will make it a little treat! Lol that’s what I try to do too. Netflix and clean something.